(We know, we know chimps are not monkeys but it made for a better headline). 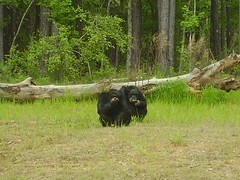 RRBJ made it to the April Discovery Day at Chimp Haven. The sanctuary is set in Eddie D. Jones Park in south Caddo Parish. We didn't spot baby Tracy or her momma. Saturday was a cold windy day. Chimp Haven may be a case of where the website is even better than the actual location (the parking area at Chimp Haven freaked us out --- we expected zombies to come lumbering out of the piney woods). And had we read the notes at the Eddie D. Jones Park website "visitors are advised to come prepared for a wilderness type experience" we wouldn't have worn the metrosexual sandals we got on sale in the men's section of The Gap. Next Discovery Day is Saturday May 12 from 9 AM until 12 PM (just wish those chimps got up a tad later). 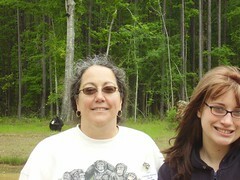 Pictured above is Chimp Haven's Assistant Director, Elysse Orchard and Katee Fontane. Don't know the name of the chimps although Dr. Orchard could tell you.